Syrian forces killed at least 17 people on Friday, activists said, as protesters piled pressure on the regime to quit and the EU tightened the noose on Damascus by slapping it with an oil embargo. Activists reported "huge demonstrations" after weekly Muslim prayers in response to calls from an Internet group that urged rallies against President Bashar al-Assad's regime under the banner "death rather than humiliation". France also announced plans to further isolate Assad, saying it would boost contacts with the opposition, echoing calls from Spain for international support for the opponents of the embattled president. Members of the Syrian community in Bucharest protest against Syrian President Bashar al-Assad, on September 2, 2011, in Bucharest, Romania. The Syrian Observatory for Human Rights said eight people were killed as security forces intervened to disperse protests in several suburbs of Damascus, including Douma and Erbeen. Six other people died in rebellious Homs province and three in the eastern city of Deir Ezzor, said the Britain-based Observatory in an updated report, adding a 16-year-old girl was among those killed. State television, meanwhile, reported the security forces killed two armed men after coming under attack in Talbisseh, a town in central Homs province. Three members of the security forces were killed by "armed terrorist groups who attacked them in Talbisseh, Erbeen and Hammuriyeh," also a Damascus suburb, according to state news agency SANA. It reported four assailants were killed in the confrontations, while an army captain, Wael el-Ali, was kidnapped in a town of Idlib province, in northwestern Syria near Turkey. Verification of the reports was not possible because foreign media are barred from moving freely around the country. One of Friday's rallies was held in support of a top official who resigned this week to protest the regime's deadly repression of dissent, while protesters also urged Russia to stop selling arms to Syria, activists said. The Local Coordination Committees (LCC) said demonstrators rallied outside the home of Mohammed Adnan al-Bakkour, the attorney general of Hama province who announced his resignation in a contested YouTube video. Bakkour said he stepped down in disgust at hundreds of killings and mass burials and thousands of arrests by Assad's regime -- claims dismissed by the regime which said he quit under duress after being kidnapped. 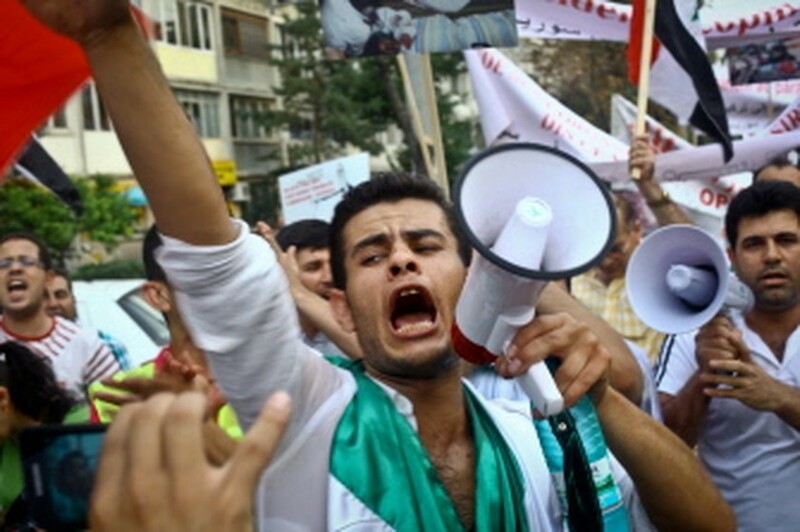 Protesters also rallied in the northern city of Amuda to demand the "fall of the regime," while other demonstrators carried signs "urging Russia to stop arms sales to the regime," said the LCC which groups activists on the ground. Demonstrators also rallied in the southern province of Deraa, where the anti-regime protests first erupted in mid-March, and in the northern province of Aleppo, activists said. Women took to the streets in the Deraa town of Jassem, the LCC said, while the Observatory said security forces blocked worshippers from leaving a mosque to take part in protests in nearby Nawa. And as ministers from the 27-member European Union met in Poland to discuss the Syrian turmoil, the EU on Friday adopted a ban on crude oil imports from Syria to punish Assad's regime for its brutal repression. The European Union expanded its list of about 50 people -- including Assad himself -- targeted by an assets freeze and travel ban, adding four Syrian businessmen accused of bankrolling the regime and three firms, diplomats said. The sanctions "will go straight to the heart of the regime," Dutch Foreign Minister Uri Rosenthal said in Poland while EU foreign policy chief Catherine Ashton said there would be no let-up to press Assad to end the repression. The oil embargo, to take effect from Saturday, will deprive Assad's regime of a vital source of cash as the EU buys 95 percent of Syria's crude oil although it accounts for a mere 1.5 percent of the bloc's imports. Meanwhile several European leaders called for more action to isolate the Syrian president, after US Secretary of State Hillary Clinton on Thursday again insisted Assad "needs to step aside." "Right now it is crucial that we isolate the regime," said German Foreign Minister Guido Westerwelle on Friday, insisting sanctions will force the regime to start a dialogue its opponents. French Foreign Minister Alain Juppe said Paris would step up contacts with Syrian opposition figures, and Spanish Prime Minister Jose Luis Rodriguez Zapatero urged international support for Syrians opposed to Assad. According to the United Nations, more than 2,200 people have been killed since the beginning of near-daily protests across the country against Assad's regime in mid-March.